The crew of the Coast Guard Cutter James offloaded about 18.5 tons of cocaine Thursday at Port Everglades in Fort Lauderdale. The cocaine was seized in international waters in the Eastern Pacific Ocean in 15 separate drug smuggling interdictions by multiple U.S. Coast Guard cutters. 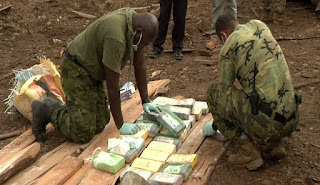 The cocaine is said to be worth $500m. 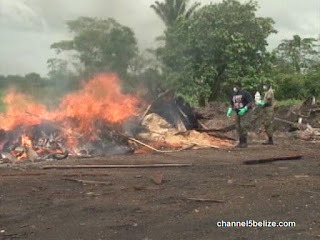 In Belize, 480kg of cocaine went up in smoke today. It was seized in a bust Nov 1. Peru and Bolivia have fallen in their attempts to eradicate cocaine production. Peru's production reached a 25-year high with about 500 tons produced in the country, a 20% increase. In 2008 Bolivian President Evo Morales expelled the DEA, saying it did more harm than good. Cocaine production there is also rising.